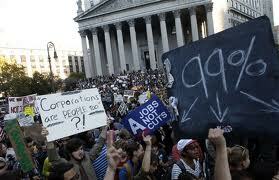 Wall Street protests and beyond: winter of our discontent? The Wall Street protests have now gone viral to more than eighty locations globally. Different places, contrasting paradigms but same underlying issues. The protests are focused on corporate greed, on rocketing wealth and income inequality, against booming bank profits post Government bailouts, about average folks struggling to keep their heads above water in a tanking economy. Banners read: “We are not merchandise in bankers’ hands!” in Lisbon, “Why am I not economically represented?” in Dublin. A mix of anger, frustration and disconnect are palpably on display. I ponder. Is the society at large similarly headed? Is this the twenty first century denouement of Capitalism? Or a clarion call for a deeper change inside each one of us? To the detractors, Capitalism is a fundamentally flawed model with the sole focus on profiteering. Numbers take over from morality; we get obsessed with what is monetarily productive but socially destructive. As Aristotle had said, “Man by nature is a social animal…………… and anyone who does not need to partake of society is either a beast or a God.” We have been genetically wired to share, care and give away but this runs counter to the capitalist theory of economic progress. We are thus getting re-wired to reward selfishness but punish altruism. So what are we morphing into- Aristotle’s Beast or his God? Our sense of purpose and values get subsumed and even contradicted by those of our organisation. We get hijacked into believing that our life’s purpose is to be successful within the corporate world, achieve that beautiful house on the lakeside or aggrandize a stable of top end cars. Such externally imposed beliefs take centre stage and drown out our true values. Our thoughts and behaviour become hostage to these underlying beliefs and as we wallow in our self created materialistic cocoon, we can no longer “hear” our true inner self. We may have once held dear the value of “environmental sustainability” but may now have become reconciled with our organisation’s growth plans of iron ore mining requiring degradation of a virgin environment. In our youth, we may have believed in “equitability of society” but as CEOs, may be perfectly willing to maximize stakeholder returns by retrenching employees through automation and out-sourcing. While a knee jerk reaction may suggest increasing taxes on Corporates and individuals, excessive taxation endangers initiatives and aspirations, the fountainheads of progress. Clearly a shift in our perspective is needed. Could we reward and support a culture of direct benefit flows to the immediate society and the environment? Can we create a great corporate culture with Purpose over Profit? Can we re-align corporate values more with our own individual ones? Can we light up the corporate sector with glorious values as under? In the October 2011 McKinsey Quarterly report on “The second economy”, author W. Brian Arthur speaks of how the emerging digital economy is causing large sections of human jobs to disappear, never to reappear. How the future economic challenge would be to shift from producing prosperity to distributing prosperity, how it would become increasingly difficult to apportion future wealth through jobs. As stakeholders, could we shift our perspective to accept corporate valuation based on non-profit values as above apart from profits? Do we have the conviction to change winter of our discontent to the glorious summer, upholding our core values of universal inclusiveness and fairness? Or would we choose to go along the path taken by John Steinbeck’s Ethan Allen? “There is a power in love that our world has not discovered yet. Jesus discovered it centuries ago. Mahatma Gandhi of India discovered it a few years ago, but most men and most women never discover it……………. Author Shakti GhosalPosted on October 20, 2011 November 18, 2011 Categories Awareness, Coaching, Management, Shakti Ghosal, TrendsTags awareness, Coaching, Ethan Allen, John Steinbeck, Management, News, perspective shift, protests, purpose, Shakti Ghosal, trend, values, Wall Street, winter of our discontent7 Comments on Wall Street protests and beyond: winter of our discontent? The Ballad of Steve Jobs- What take-aways? Steve Jobs is no more. An icon of our times passes on. Gigabytes of eulogies, outpourings and videos are all that remain to remind us of him. As I sit on the keyboard, I wonder what is it that compels me to add my own tuppence about the Man. I did not know him personally. I have never met him. My only connections are two devices that I own- an IPod and an ITouch. But wait! There surely must be some other connection. I revisit the video of his Commencement Address at the Stanford University Graduation Ceremony delivered six years back. And I see myself clapping in front of the monitor as the last video frame fades out. I set out to determine what really made the man. Not what I could draw inspiration from. But more a curiosity about what made Steve tick, what were those inner moorings that made him go on the path that he did. To conform to the expectations of his foster parents (who had adopted him at birth), Steve went to college but dropped out soon after since as he himself put it, “I saw no value in it”. Clearly Steve’s values and associated beliefs lay elsewhere. Which brings us to our Lesson number One. That no matter how hard you try to achieve goals set by other people, you are bound to under-perform or fail if they are not aligned with your passion, your own underlying beliefs. Even after dropping out of college, Steve continued to attend classes where his interest and curiosity lay. It was then that he did a course in Calligraphy, something which his heart proposed rather than his mind. Steve goes on to tell us how years later, he could use this competence to build beautiful typography into the MAC computer.So Lesson number Two. Listening to your heart is listening to your inner values and beliefs. And this unleashes high energy, great feelings and ultimately terrific results. To use Steve’s expression, “…. when I look back in life, I can see unrelated dots connecting…” This is the power of positive beliefs. 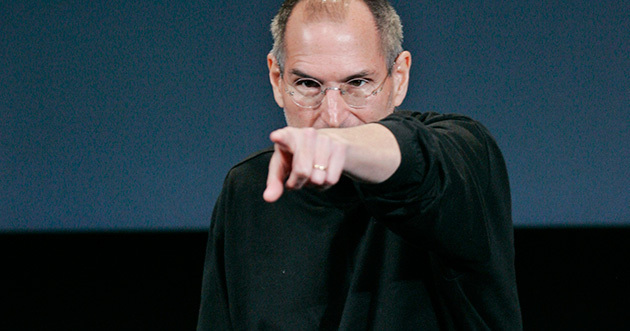 Steve believed that getting fired from Apple, the company that he created, was the best thing that happened to him. The event allowed him to gain awareness of his own self on a much higher plane. It also allowed him a deeper understanding of two other aspects about himself. One, having become a hugely successful entrepreneur at a young age, Steve developed damaging inner beliefs like, “My creative passion is essential for the organisation, I know best etc”. These led to the display of negative behaviours of arrogance, overbearing know-all attitudes etc. Clearly this was not conducive to organisational harmony and development. As Steve himself puts it, “sometimes life hits you on the head with a brick” to bring you back to your roots- your values and passion. Second, his getting fired allowed him to positively confront and overcome his self doubts of “not being good enough”, to face his fear of “ being perceived as a public failure” which almost made him “ run away from the valley”. What a fantastic shift in perspective! Such self awareness surely has the power to change our beliefs and thoughts and become a powerful driver of behaviour change harnessed for great forward motion and success. Are we willing to take the baton and move forward? Are we ready to re-unleash the requisite creative energy and passion for the NEXT- PIXAR? And this remains our final lesson number three. As Steve remarked, “Stay hungry, stay foolish”. Author Shakti GhosalPosted on October 14, 2011 November 18, 2011 Categories Awareness, Coaching, ManagementTags assumptions, awareness, Coaching, empowerment, Management, News, Personality, perspective shift, self consciousness, Self discovery, Shakti Ghosal, steve jobs, underlying beliefs, valuesLeave a comment on The Ballad of Steve Jobs- What take-aways?